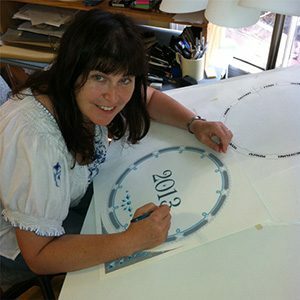 Unique Ketubah Designs by Mickie Caspi, Dragons, Teacups, Unicorns? 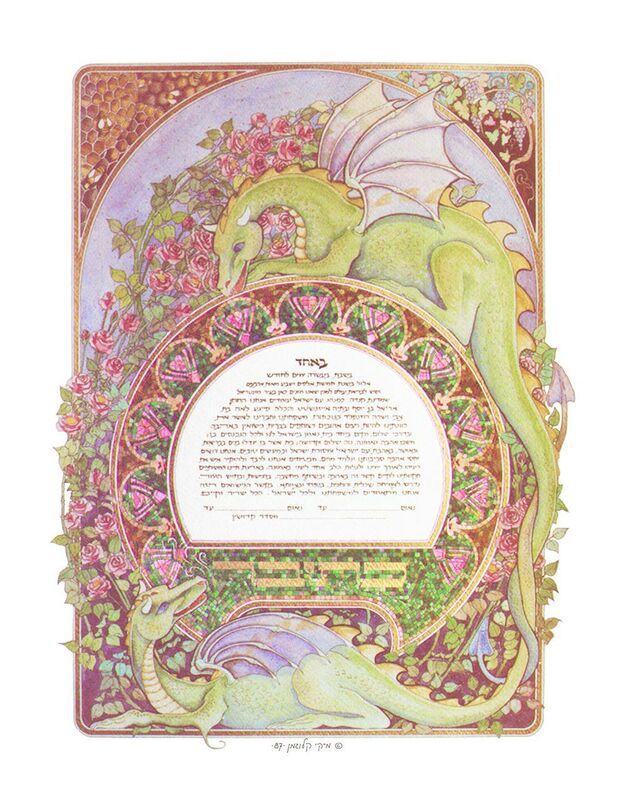 Home » Blog » Unique Ketubah Designs… even Dragons? What says “I’ll love you forever” more than dragons? I love listening to the interesting ideas that couples envision adorning their unique ketubah, and then trying to create a work of art for them that is a manifestation of their own ideas and a creative expression of who they are as a couple. 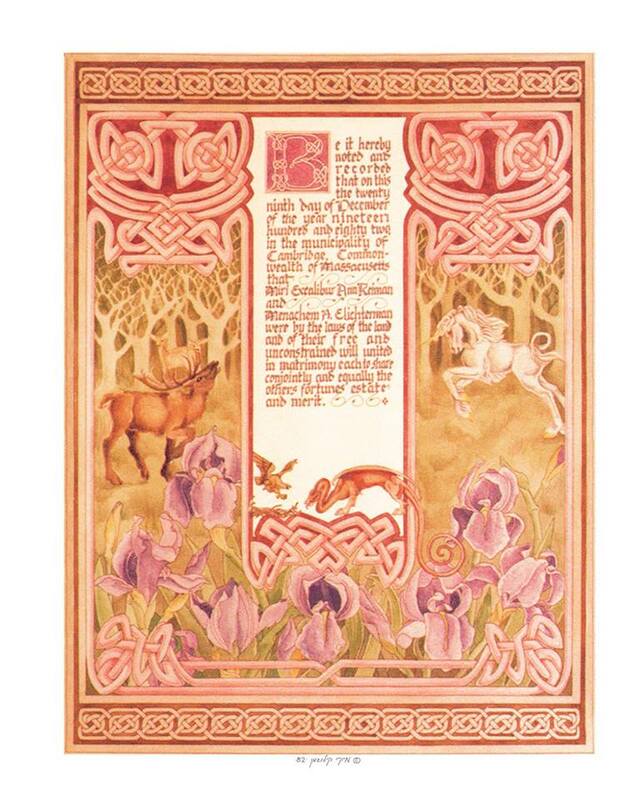 From teacups, tents, and kitties, to eagles, unicorns, and dragons, I have had requests for a lot of (ahem…), very unique ketubah images to be painted into a couple’s design. One couple requested an observatory to be added to their offset lithograph ketubah. Normally this could only be accomplished by creating an original, hand painted Ketubah. Fortunately, the ketubah they chose incorporated a scene of Jerusalem at night that included a few domed rooftops. With a few brushstrokes, one of the domes was perfect for converting into an open observatory with a telescope trained on the night sky. I always think “Now I’ve seen it all!…” until the next couple comes along and I know that I will never have seen the endless creativity of people in love! I made this original handpainted ketubah back in 1986. Thank you Fay Rosenfeld and Eric Eisenstadt for commissioning this unique ketubah, I had such fun making it! If your rabbi has no problem with, shall we say ‘un-orthodox’ images for your Ketubah, I would love to discuss your ideas with you. Unlike some religious artwork, there are really no prohibitions regarding designs and images to be used on a Jewish wedding contract. If you feel that an image or a set of images is a perfect representation of you as a couple, than you can contact me to discuss options for your original hand painted ketubah. You can view other original ketubah designs (not these ketubot) to show you a range of possibilities. However, any design that you see on this website, whether it be a greeting card, invitation, bar mitzvah certificate, baby naming giclee print, or lovers gift, etc., can be adapted and enhanced to create a truly Unique Ketubah to celebrate you and your marriage. Previous post: What do the Canadian National Anthem and a Jewish Wedding Contract have in Common? Next post: What is the difference between a Hand Painted Original, a Giclee and an Offset Lithograph Ketubah?